BRANDfog’s 2014 Global Social CEO Survey set out to examine social media’s importance for executive and C-level communication, and includes responses from 1,000 U.S. and UK employees in diverse companies. Companies surveyed range in size from startups to Fortune 1000 companies across various industries. Below, I’ve recapped three trends that BRANDfog believes will shape modern business communications. 1.) Social CEOs make better leaders. According to BRANDfog’s survey, “75% of US respondents agree that C-level participation in social media leads to better leadership.” That’s up from 45% who agreed in 2012. What makes a great leader can often times be subjective. Many naysayers of social media for C-level execs inevitably argue that social media has nothing to do with high-level leadership activities such as managing personnel, revenue generation or maintaining culture. I respectfully disagree. LinkedIn has quickly become a highly active networking and talent acquisition hub for C-level execs, as well as high earners and professionals with advanced degrees. With 255 million monthly active users, Twitter is essential to any CEO’s personal brand awareness, company brand and thought leadership strategies. Most C-level professionals have already bought into the idea that content is vitally important. Yet, C-level execs seem to have a harder time fully buying into the value and importance of social media. It’s a simple leap—social media is a form of content that many customers and prospective customers are consuming on a daily basis. Thus, C-level participation in social media is critical. Action Item #1: Review leadership activities and responsibilities. Then, brainstorm the social media platforms that can enhance these activities. For example, if thought leadership is a monthly activity, consider LinkedIn or Twitter as platforms to propel executive profiles and messaging. If new business development and networking are common activities, having a LinkedIn profile is a must. If customer appreciation and personal brand building are activities, Twitter is your platform—along with any networks your customers are using daily (Facebook, Google+, Instagram, etc.). 2.) Social CEO engagement leads to brand trust. Another recent report from Gallup, Inc. suggests that social media has little-to-no influence on consumers’ purchasing decisions. Although it’s hard to argue with 62% of Gallup’s respondents claiming social doesn’t influence their purchasing decisions, more than 6,000 of those respondents (35%) said social media has some or a great deal of influence on their purchasing decisions. Influence can quickly morph into loyalty. No matter what size your business is, brand loyalty and positive word of mouth generate revenue. An integrated social strategy is built under the assumption that stories create an emotional bond between a customer and a brand, a client and a product or service. Social media helps build that bond, amplifies customers’ brand stories, and connects personally from leadership through end users. Action Item #2: Ease into social—consider a phased executive appraoch. First, set up a LinkedIn page, complete with a professional photo, thoughtful summary, company website and previous roles and responsibilities. Next, set up a personal Twitter account. HubSpot co-founder/CEO Brian Halligan (@bhalligan) provides a great setup guide for executives on Twitter. 3.) Social media is modern PR. These stats don’t shock me at all. What do you think is more powerful for a brand: multiple tweets, shares, Facebook posts and LinkedIn updates about a company’s new, amazing product—or a traditional press release that goes out on the wire? Gallup’s report suggests the press release is more powerful. However, I believe if a few of my friends read about an app on a tech pub, download it, love it and post on social media platforms about how great it is or a how amazing a new restaurant is, I’m far more likely to act than if I happen to see a press release online about the same topic. I’m betting I’m not the only one. Action Item #3: When was the last time you typed your company name or your industry into https://twitter.com/search-home? Give it a try. See what people are saying about your brand or what conversations are happening within your space. Twitter search is a great tool to discover a constant feed of online word of mouth. The stakes on social are higher today than they were three years ago. It’s less about which CEO has the most likes and followers, or which CEOs are posting and updating their social profiles the most. It is about establishing the human presence behind a brand’s logo, and connecting with consumers in the more transparent means they’ve come to expect. CEOs and company executives who are already taking advantage of social media to communicate with customers are winning. Richard Branson (@richardbranson), Jeff Weiner (@jeffweiner) and Mariss Mayer (@marissamayer) are a few CEOS demonstrating to their customers, competitors and employees that they are committed to impacting their brands’ growth. As Levar Burton used to say, “But you don’t have to take my word for it.” Check out WorldOfCEOs.com’s 2013 Top 60 CEOs on Social Media. Not too shabby a list, right? 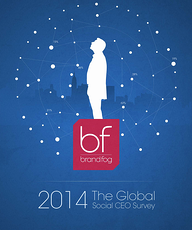 For the full report, download BRANDfog's 2014 Global Social CEO Survey. Are you a social savvy CEO? Do you have other action items to consider? We’d love to hear your thoughts in the comment section below.